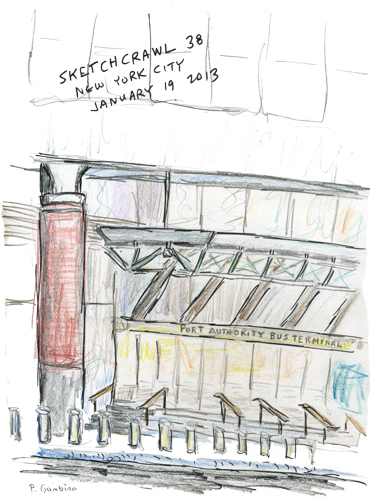 Last week's sketching was at the Time Warner Center at Columbus Circle. The day was cold and early on there were very few people. As the hours passed, people arrived to eat. shop, walk and hangout. Most of our group was out due to the flu...can you sketch a virus? This Saturday we will meet at the Morgan Library. Their building and exhibit of surreal drawings should be interesting. We'll start at 11:00 and as always remeber to bring your favorite sketching materials. Note that there is a $15.00 admission fee. This Saturday we will meet in the main lobby of the Time Warner Building at Columbus Circle. Plenty of people, shops, food and most importantly, it's indoors. It was a great day of sketching for the 38th WWSC. 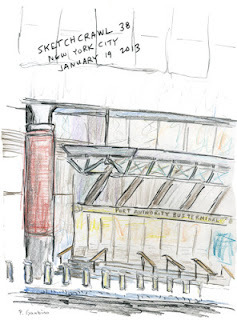 The NYC Sketchers group was out in full force with quite a few first timers! It was a fluid group-coming and going, but a good time was had by all. 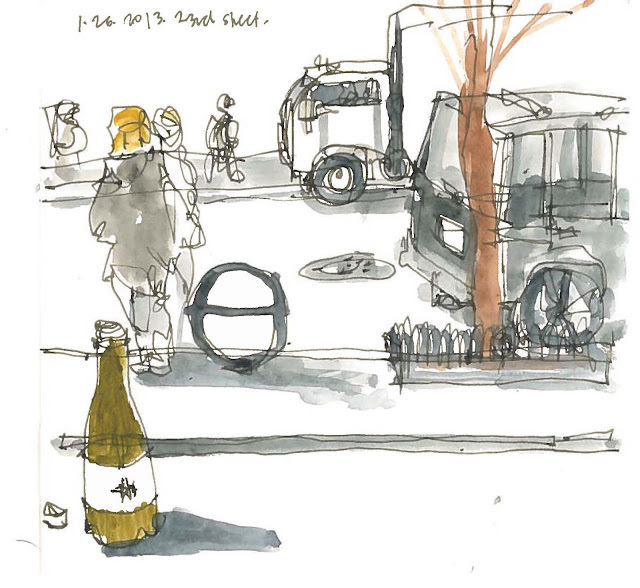 We also tried out a Tokyo group practice...sitting, eating and sketching...it was great. Trains? Did anyone say trains? 1) Skaters almost never stand still. It's their continuous movement that looks so beautiful. But it's also their continuous movement that makes them really hard to capture in a drawing. 2) There was no heated gallery where we were sketching. It was continuously cold. One skating rink had figure skaters and the other had teams practicing ice hockey. After we went to a restaurant where it was warm and the people sat reasonably still. Next week is The worldwide sketch crawl #38! Come join us as we ramble through the Port Authority, Times Square and Penn Station. We'll wind down in Korea Town. If it gets too cold we may stay inside and underground for a while, so make sure to meet up on time. We went to the Museum of Natural History on December 29th. It was a cold rainy day and I had the hope the museum would be deserted. Well, that didn't happen. I believe every tourist in NYC found there way to the museum that day, as well as every family stuck at home facing a rainy weekend with the kids. It was jammed. The great thing about the museum is that it's filled with animals and they don't move. You can walk around trying to find the best angle and then do your sketch while they hold still for you. What didn't hold still though were the hundreds of people mobbed around each exhibit. It was so crowded that we couldn't open up watercolor kits or try anything elaborate. After the first dinosaur drawing which was done in ink, I stuck with pencil. What an amazingly versatile tool the pencil is. 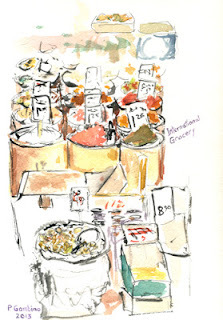 We're posting our sketch dates on the blog for those who use the blog to follow our escapes. 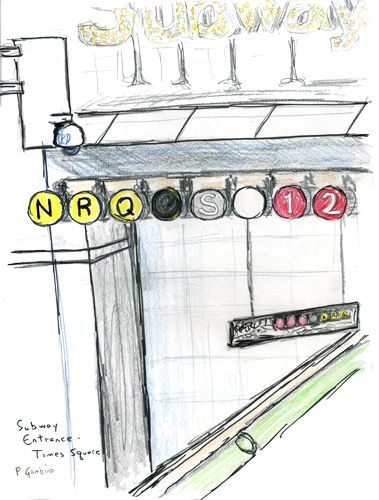 Also, January 19th is the 38th International Sketch Crawl and we have some very nice things planned...stay tuned. This coming Saturday is likely to be the nicest day of the week , in terms of weather - and drawing opportunities. We're going to meet at the SkyRink, which is located at the Chelsea Piers. The SkyRink has a heated gallery that overlooks the skating area. We'll meet there at 10 AM. There are loads of things to do at the Pier and if the weather is as warm as expected we can even draw some of the boats outdoors or the rollerbladers. The Chelsea Piers extends for several blocks. The SkyRink is at Pier 61. The best entry point to hit the SkyRink is to come in from West 21st Street at 11th Avenue. 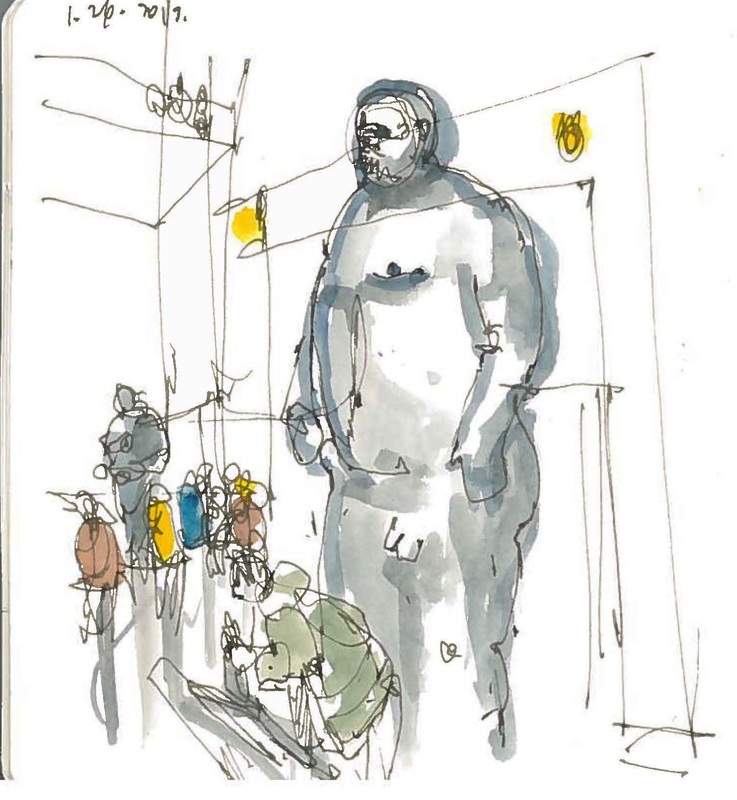 Best of all, when we're done with doing our own sketching the Chelsea Art Galleries are across the street with plenty of art to see as well as interesting restaurants where we can grab a bite. 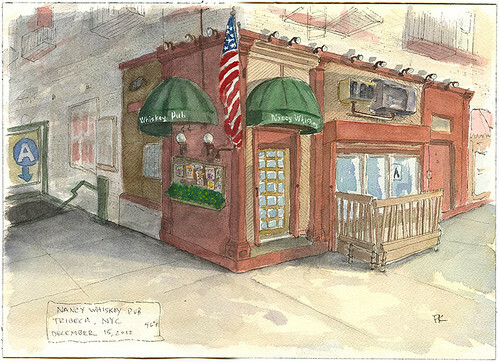 On December 15th we met at the Bookstore Cafe for their 3rd Annual Christmas Carol Marathon. Lots of interesting people to draw.